This is a series of large scale dynamic environmental or land art works which are made using the power grid and public lighting systems of urban areas. The power grid in developed countries is computer controlled and urban power distribution systems are segmented into individually controllable zones which may be switched on and off by remote computer control. These works create time-dependent patterns using the lights of the city by sequentially turning individual zones of the urban power grid on and off, using the existing computer control system. The pieces are designed to be viewed from a distance, such as an overlooking peak, or from the air or space, at night. This series continues the objective of the Sky/Ground pieces in manipulating large scale visual processes in the environment which have been producing inadvertent markings as the result of human activity. The night lights of cities are one of the few artifacts of human occupation which are visible from space. Astronauts have remarked with awe on the visual impression of the night lights cities as seen from space, particularly in the developed countries. 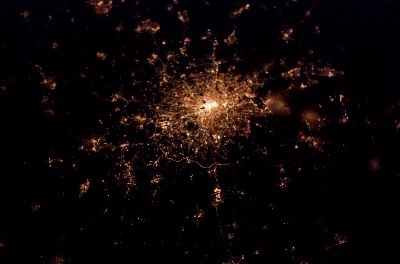 Astronauts have also observed and even photographed some of the large scale blackouts from space and these have also been recorded by earth monitoring satellites. These works involve conscious and deliberate intervention in these hitherto inadvertent markings. These are proposals for pieces whose realization is admittedly problematic. If executed in a currently inhabited city, they require the acquiescence if not explicit permission of virtually the entire population. With the exception of the area around Chernobyl, there are no known urban sites which possess an intact power grid but are uninhabited. Perhaps these works can only be executed in the future, at a time when the manipulation of the power grid is no longer an inconvenience to the residents of the city due to abandonment or is a necessity for implementing power conservation through rolling blackouts. This might be the case if an area experienced complete abandonment as the result of a natural or technological disaster or attack which has made the area uninhabitable but has preserved the power grid and public lighting system relatively intact. The piece in this case would serve as a monument, returning luminance and motion to a night urban vista which would otherwise be dark and static in the absence of human habitation. 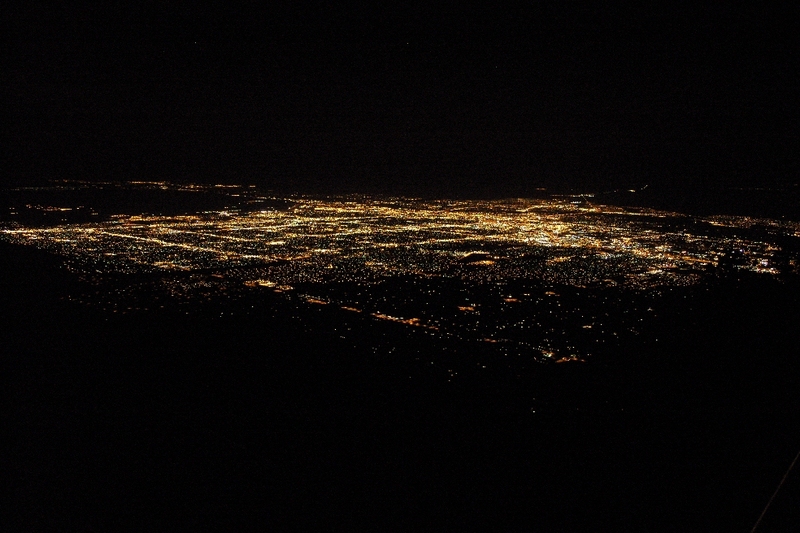 If one watches the night lights of a city, the vista possesses significant motion, not only from the movement of the lights of vehicles, but a surprising number of individual stationary lights being switched on and off. In the absence of habitation, this motion would cease but this work would reanimate that motion with the implied motion of the stationary lighting being turning on and off, zone by zone. Another potential framework for the pieces actually being executed would be in the case of an energy shortage, where rolling blackouts are required to avoid overloading the larger regional grid. These have been instituted in California and Iraq in recent memory and are relatively commonplace in developing countries. These works would provide an alternative framework for instituting these rolling blackouts, instead of some possibly covert economic or demographic criteria. Some rolling blackouts in the past have been controversial in that the controlling authorities have been accused of disrupting power to areas with underpriveleged socio-economics in order to insure reliable power service to more affluent neighborhoods. The undisclosed and potentially discriminatory criteria employed to date would be replaced by a more egalitarian decision process based on strictly visual considerations. The planning of the pattern of rolling blackouts suggests a larger organizing principle for related works, the manipulation of the inter-city power grid itself, on a regional or national basis. Again, the grid distribution points are computer controlled. 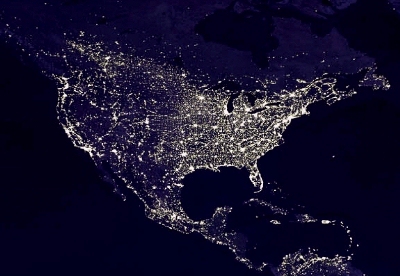 In large scale accidental blackouts, segments of the grid are usually deliberately switched off under computer control, to prevent anticipated damage from overload, sometimes erroneously predicted. The same system could be used to deliberately switch sections of the national distribution grid to create related works. Both the grid control system as well as the individual substation control system at the city level suggest another scenario where similar events to those proposed here might be achieved, deliberate as opposed to inadvertent, but malicious. Given the existence of a distributed control system, the possibility suggests itself that motivated hackers might penetrate the grid or substation control systems and cause unwanted switching events to occur. This might be another case of hackers upstaging artists. Presumably the power distribution control system is highly hardened and not accessible to public networks, making this difficult if not impossible. Various cities will be selected as subjects for individual studies. 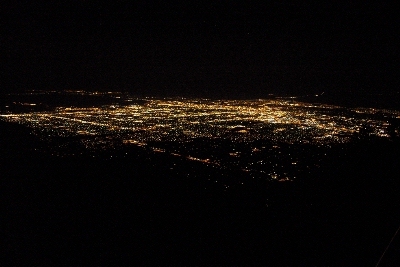 Aircraft overflights will acquire digital video and still night images of the city which will be used as the basis for computer animations of the proposed power switching which would comprise the final work. Inquiries of the local power utility will attempt to determine the locus of the individually switchable power distribution zones, the substations, and this geometric data will be projected onto the nighttime aerial video footage of the lights of the city. A computer graphical animation will then simulate the actual execution of the work. An attempt will be made to accurately model realistic switching frequencies as well as the visual characteristics of the switching process. For instance, lighting will quickly extinguish when power is switched off. When power is switched on in a zone, incandescent light will return immediately, while light sources such as sodium vapor lamps will have a significant turn on delay. These videos would be produced in 16:9 HD format in order to make use of the enhanced resolution to better resolve the thousands of points of light in the night cityscape. 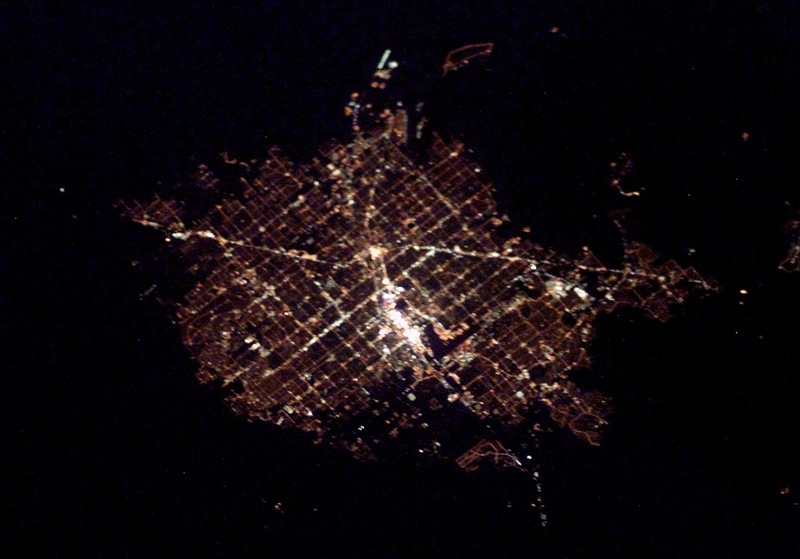 Inquiries into the structure of the electrical power grid of two cities in the US Southwest; Albuquerque, New Mexico, and Dallas, Texas, for the purpose of the first studies, have encountered surprising obstacles to obtaining this information. Apparently, the Homeland Security Administration has provided cautionary notices to power utilities to now consider the distribution structure of the utility critical infrastructure security information and not be publicly distributed, despite the fact that information, such as the location of electrical substations, is obvious by inspection. There is more information about the varying responses obtained from electrical utilities in the Project Chronology.